PUERTO RICAN FEATHERWEIGHT Orlando Cruz said he revealed his sexuality to the public in order to feel better about himself. 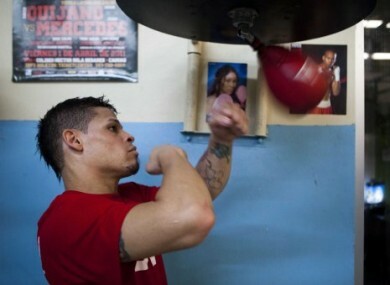 Until last week, Cruz was a only household name in his native Puerto Rico, but since declaring his homosexuality, his name has been hitting the headlines around the world, becoming the first active boxer to make such a declaration. Cruz broke the news on the eve of his WBO world featherweight title eliminator against Mexican Jorge Pazos, which takes place in Florida on Thursday. The bout has become something of a sideshow, with Cruz revealing he has been carrying the secret since turning professional 12 years ago. “I’m not where I imagined I would be,” he said “I deserve to be happy and wanted this for many years but did not declare (my sexuality). “I know this is a male sport and a lot of people discriminate against the gay community too. I thought they would ignore me or put me down and I decided to stop this and feel better. With a record of 18 wins from 21 fights, the boxing community have questioned why Cruz invited such attention so close to an important fight. His opponent, however, has refused to be drawn into Cruz’s news, instead choosing to focus on a highly driven and tough opponent. “I feel him to be strong, with good footwork and with improved strength,” Pazos said. Cruz’s favourite boxer, Muhammad Ali, stood firm in his refusal to serve in the US Army in Vietnam. And now Cruz himself has honoured his own beliefs and in the process broken the last great taboo in the sport of boxing. Email “Puerto Rican boxer: I came out so I could feel better about myself”. Feedback on “Puerto Rican boxer: I came out so I could feel better about myself”.